If you're the sort of curmudgeonly fantasy owner who dismisses all prospects as overhyped and likely to underwhelm, then please consider the names below to be your do-not-draft checklist for 2019. 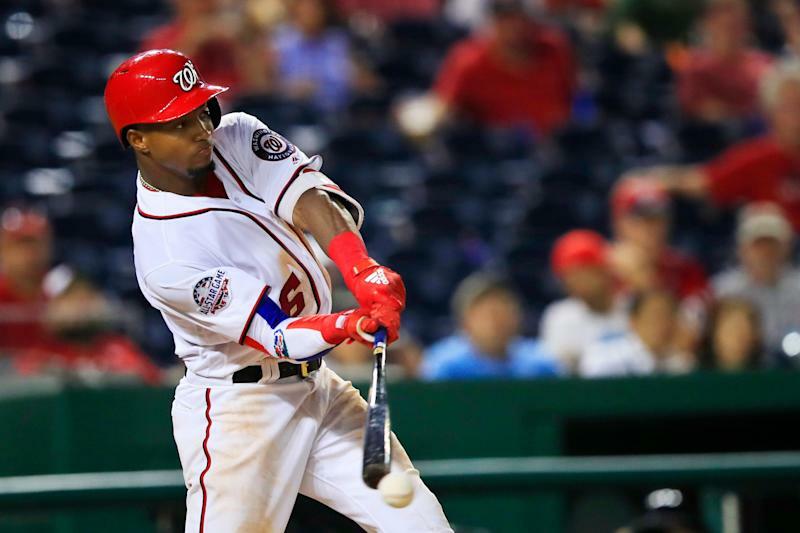 You almost certainly ignored Miguel Andujar, Ronald Acuna, Juan Soto and Walker Buehler last season, and you may have been successful without 'em. There are many potential paths to a fantasy title. You don't need to rely on rookies. If you don't like fun things, then, by all means, don't go prospecting. But for anyone open to the idea that first-year players can (and consistently do) return significant fantasy profits, today we present nine of the most intriguing prospects for the season ahead. Most of these names should already be familiar to competitive owners. We're not trying to pretend we've unearthed any previously undiscovered gems here. Instead, we're simply giving you the prospects who should be of greatest interest to mixed league managers in redraft formats. These dudes are long gone in dynasty leagues, presumably. Vlad is dealing with a mild oblique strain, as you've no doubt heard, shelved for three weeks. He was already going to be subject to the usual service time manipulation that occurs in MLB, the only league that routinely and unnecessarily hides its best young players. But there's no reason to think we won't see Guerrero in Toronto when the calendar flips to May — and it's going to be glorious. The kid hit .402 over 234 at-bats at Double-A last season at age 19. Four-oh-two. For the year, he slashed a ridiculous .381/437.636. Vlad never strikes out, his power is legendary, and the projection systems all expect him to hit .300-ish (or better). He's a monster. There's really no such thing as a can't-miss prospect, but Vlad Jr. is as close as it gets. I have no qualms with his top-50 ADP. Another monster. Jimenez slashed .337/.384/.577 in the high minors last year, and he was at his best when he hit Triple-A (.355/.399/.597). Jimenez finished with 53 extra-base hits (22 HR) in just 108 games. He's basically unchallenged by International League pitching. When he arrives in Chicago, he'll immediately hit in the heart of the order. You’ll want him. Luzardo's spring has been absurd. Check the numbers: 9.2 IP, 15 Ks, 4 BB, 0.93 ERA, 1.03 WHIP. He struck out 129 batters over 109.2 minor league innings last season, posting excellent ratios (2.88 ERA, 1.08 WHIP). Luzardo may not be the at the very top of the pitching prospect ranks, but he's close. He's also a near-lock to pitch in the early weeks, which makes him a draft day priority. Robles hasn't hit for significant power at any minor league stop, but we know he's going to run. He swiped 37 bags in 2016 and he's reached 20 steals in multiple seasons. The expert community is all over him, as he's gone for astonishing prices in N.L LABR ($27) and Tout ($25). Robles has been an on-base machine in the minors (career .392), he's terrific defensively and he has eventual all-star upside. Michael Taylor's injury (knee/hip) erased any concerns about playing time. Expect him to be an asset in steals and runs, while hitting for a respectable average. Two years ago, Tatis produced a 22/32 power/speed season in the minors at age 18, finishing at Double-A. It's clear that he has massive fantasy (and reality) potential. He just turned 20 in January and he's likely to spend the season's opening month or two in the high minors. When he arrives, however, he's going to be all kinds of fun — likely to be a three or four-category asset in our game. Tatis is having a big spring (10-for-33, 6 XBH, 2 HR), so we have no reason to think his bat isn't ready. Paddack's minor league numbers were silly last season (120 Ks, 90.0 IP, 0.82 WHIP) and he's had a tremendous spring. He's a buzzy player within the fantasy guru community, too, for what it's worth. Paddack's change-up is an evil thing. It's tough to believe he won't deliver an impressive K-rate with useful fantasy ratios. It feels as if we've been hyping Senzel for a decade, but somehow he's still only 23. He's raked at every minor league level, hitting .314/.390/.513 for his career. Senzel has been blocked in the bigs until recently and he's dealt with a medley of injuries, but there's little question about the readiness of his bat. We're going to see him in center for Cincy early in the season, if all goes according to plan, and he'll bat at or near the top of the order. He'll have immediate fantasy appeal as a source for double-digit homers and steals. Catcher is a minefield this season, so we'll take whatever help we can get. Jansen reached base at a .390 clip at Triple-A last year and he posted a .400 OBP across three levels in 2017. He has doubles-variety power, but he's still likely to clear the fence 10-14 times in a healthy season. Jansen walked more often than he K'd in the minors just two years ago — a promising sign. He's a decent bet to achieve mixed league relevance. ... and he might very well have the best arm in the prospect pool. He's coming off a weird/difficult minor league season that involved injury and suspension, but he was very good in the Arizona Fall League (36 Ks in 26.0 IP, 0.96 WHIP). Whitley has had a spectacular spring, too. When he makes his way to Houston, it will be an actionable fantasy event.